There is a lot to do when planning a vacation or a business trip and rarely enough time to get it all done. This is especially true if you have pets that need to be well cared for while you are away. St. Bethlehem Animal Clinic offers safe, comfortable and cost-conscious veterinarian-supervised boarding in our state-of-the-art boarding facility so you have one less thing to worry about. Modern Accommodations: To be succinct, our boarding facility is really nice. 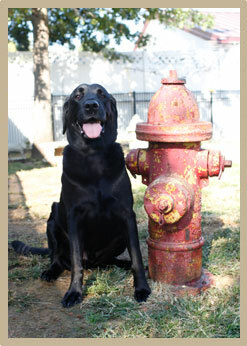 Built in 2002, our cat and dog boarding areas make for a very clean and cheerful home away from home for your pet. We are so sure of this that we would love for you to come in and take a tour. Safe: During your pet's stay, he or she will be under continuous veterinarian supervision and cared for by our specially trained clinic staff. To minimize the risk of picking up an illness from another pet or injury, we will not exercise your pet with other pets. We also require all pets to be up to date on vaccinations and that they are healthy and parasite-free in order to board with us. Comfortable: Our boarding facility has state of the art temperature and humidity control year round. We utilize "all in-all out" ventilation consisting of minimal recirculated air. This greatly increases our utility cost of heating and cooling but greatly decreases chances of pets boarding with us developing kennel cough. We also do NOT have cold wet concrete floors where pets are kept. All pets have quality elevated floors and/or beds. This greatly reduces the chance of our guests suffering a respiratory illness. Our canine boarding area has elevated floors and bedding and cats have their own bathroom area, sleeping area and living room. Cat Friendly: Our cat facilities consist of state of the art suites that are in stress free rooms that allow no dogs and no pet grooming with noisy clippers, etc. 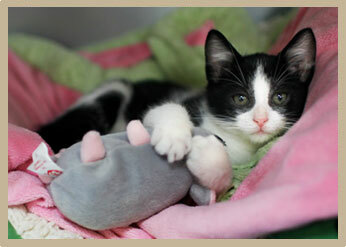 Cats receive personal "playtime" attention from our caring staff several times daily. Visiting your cat while boarding is always encouraged without an appointment. We are never embarrassed for you to see how your family member is being treated. Cost Conscious: Boarding rates for both dogs and cats depend on the type of accommodation you choose for your pets. Our boarding rates are "ALL INCLUSIVE." Unlike some other facilities, we have no extra hidden fees associated with the boarding itself to surprise you when you return for your pet. There is no extra charge for routine oral and topical medication administration. There are no nights charged when you must make a last minute cancellation. Emergencies: We understand that sometimes the need for pet boarding can be an emergency situation, which is why we offer after-hours emergency admittance. Just call (931) 206-0683. Dedicated Staff: Perhaps the most important thing that sets us apart is our dedicated and caring staff. In fact, staff will actually bring sleeping bags in and spend the night or weekend at our boarding facility during inclement weather in the winter. Healthy Diet: While we will feed your pet a premium diet during his or her stay, we much prefer that our guest bring their preferred diet from home. This greatly reduces the chance that your pet will suffer from any intestinal distress or diarrhea. Cat Suites for the individual cat that can be expanded for families boarding two or more cats. Each cat has its own separate bathroom area, sleeping area, and living room. General Dog Boarding featuring stainless steel runs with elevated floors so that your pet is never on cold, wet concrete floors. Elevated floors also greatly decrease boarding stress diarrhea. They are exercised 3-4 times daily. Mini-Suites are designed for one large dog or multiple small dogs. Space is limited to 25 mini-suites to provide a relaxed and less stressful atmosphere for your pet. Suites designed for up to three dogs. Space is limited to 14 suites to provide a relaxed and less stressful environment for your pets. Suites have access to TVs for your pet's entertainment. Presidential Suite is the largest accommodation and designed for multiple dogs in a family. For optimum care of all pets entrusted to our care, we maintain a "closed" facility, meaning all pets allowing the boarding facility must be up to date on all of our recommended health care procedures including vaccinations, heartworm testing, heartworm prevention, intestinal parasite testing & treatment, and external parasite control. All pets are examined by our kennel technicians upon admission and any abnormalities are examined by one of our staff doctors before being allowed into the facility. Vaccines: Without exception, all pets must be up to date on their vaccines and have received them from a veterinarian. For dogs these include annual distemper, parvovirus, leptospirosis, and rabies as well as biannual (every six months) Bordetella and parainfluenza. For cats we require annual feline panleukopenia, respiratory disease complex, chlamydia, and rabies. We also strongly recommend cats have the feline leukemia vaccine. Parasites: Without exception, all pets must have had a clear heartworm test and internal parasite exam within the past year. Reservations: We do not require reservations, but strongly recommend them, especially around holidays. Food: We will provide your pet with a premium diet, but we very strongly recommend you bring your pet's usual diet. This greatly reduces the incidence of intestinal stress and diarrhea. Grooming is more than just a bit of pet pampering; it is an important step in keeping your pet happy and healthy by preventing disease. For example, regular baths and nail trims help remove harmful germs from the fur and paws that are picked up as your dog plays outside, and provide a great opportunity for the groomer to notice dried or cracked paw pads or skin issues. 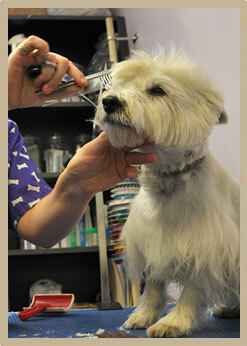 St. Bethlehem Animal Clinic provides expert grooming with St. Bethlehem Grooming Spaw. St. Bethlehem Grooming Spaw is located within the adjoining building behind the clinic along with our suite boarding facility, which offers a full range of services for all-breed grooming of dogs and cats. Rachel Hodges is the head groomer and manager of the grooming services. Sedation is also available from our veterinarians at your request when needed for that pet not happy about being groomed. Rachel will be happy to provide references, as well as have you stop by to see our state-of-the-art facility. You may book appointments through the clinic (931) 645-4111 or call Rachel direct at 931-802-0719. Your pet will love her and you will love the new look of your pet.